Hot summer days are finally here and cravings for ice-cream and all things cold are at an all time high. As kids, summers meant a whole lot of ice-creams and Popsicles ...not store-bought but made right at home. Mom conducted ice-cream making classes and after each class my brother and I got to gorge on atleast 3 flavours at a time. She has never used an ice-cream maker/machine anytime and the fact that she didn't made those ice-creams even more precious and special. Last year I made ice-cream at home for the first time without the use of a machine. Its simple but requires time and effort, which are definitely worth it. Our all time favourite flavour is Mango, and there is something about Indian Mango ice-cream which sets it apart from Mango ice-cream I've eaten anywhere else. It simply tastes so much more mango-ey! 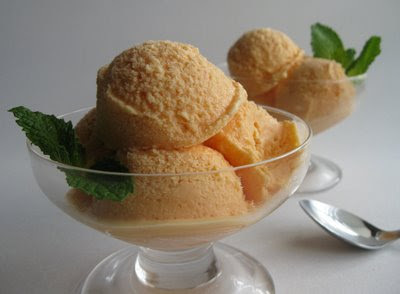 The following is mom's recipe for Mango ice-cream. I made this ice-cream again this year. Hand-held electric beater, the one which can withstand heavy whipping. Make a smooth paste of the custard powder and ¼ cup of milk. Bring remaining milk to a boil in a heavy saucepan. Add sugar and stir to dissolve. When the milk comes to a rolling boil, reduce heat and slowly stir in the custard mixture. Keep stirring till the milk thickens. The custard is ready when it coats the back of a spoon. Remove from heat and let cool completely. While the custard is cooling, take a large bowl (which will fit into your freezer) and blend the mango puree with the condensed milk. Stir well to combine. Once the custard has cooled, add it to the puree-condensed milk mixture. Also add the heavy cream, the vanilla extract and food colour. What follows next is the important step…the 'churning' or whipping part. Since this ice-cream is made without an ice-cream maker, doing it right manually determines the final quality of the resulting ice-cream. Remove bowl from freezer and using a hand beater, whip the mixture for 10 minutes at the highest speed on your beater. The mixture will begin to bubble because of the whipped cream. Return to freezer for another 30 minutes. Repeat the whipping process, but reduce time to 5 minutes. Return to freezer for 30 minutes. This needs to be done 2 more times(once every 30 mins). By the third time your mixture would have thickened and would be harder to ‘churn’. Let your hand-mixer do its thing. 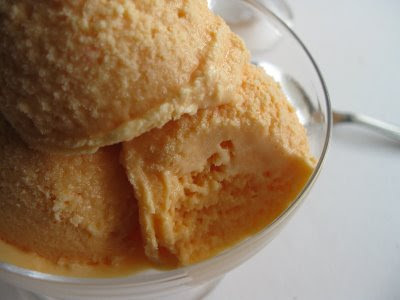 After the last churn, you can transfer ice-cream to containers and then freeze or return the same bowl to the freezer. Freeze overnight or for atleast 6 hours. This ice-cream brought back very sweet memories. And at the rate we are eating the ice-cream I might have to make another batch very soon! Namratha..This Looks Delicious! Perfect Home made Ice-Cream's..
wow! its looking yummy! your pics tempted me more! will surely try! I never knew that Ice cream can be made without a machine.. thanx for sharing this.. would love to try it. hey Nams even i hv posted this in my blog....same pinch...Try to chk it out when u get time...Ur icecream looks delicious..I prepared this with a slight variation.. I've never tried making my own ice cream, but I would certainly like to try this recipe. I don't have an ice cream maker, and I surely don't have any room in my kitchen to store one. Thanks for this informative post. awesome! reminded me of my summer hols too.. Mom would make it and Gosh!! we were so impatient, would get to lick the beater and when she was not around we would peep into the freezer every 10 mins to check if it was done!! Hey Namrata, it looks awesome and perfect...I am totally tempted .... perfect for summer. 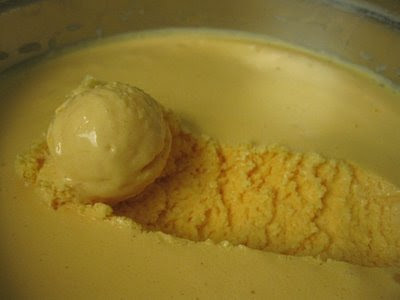 my aunt used to makae icecreams in the exact same way using custard powder and the blend-freeze-blend method. Ive been looking for a recipe for this as i didnt know the measurements and knew just how to make it. Thanks :) looks delicious!!! 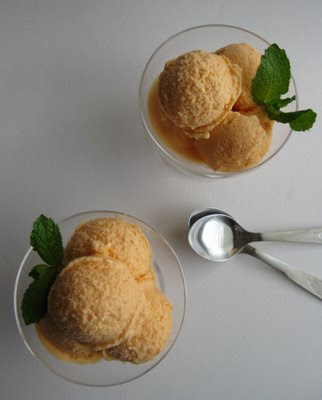 I have never made icecreams at home.Remember my mom making them when i was a kid...guess i had forgotten abt for long.Your recipe sounds very interesting...and very inviting.Am gona make this soon:-)Thanks for sharing this wonderful recipe! @ SJ, the mango puree isn't as sweet really...and if you feel this is a lot of condensed milk, you can use 3/4th (this recipe needs at least that much) and then taste the mix before you freeze(for the first time). Hope this helps! Thanks for visiting my blog,i saw the comment on my cake just now..home made ice cream looks delish ,looks just like store bought..
WOw thats really mouthwatering ..feel to have a glass. wow its mean with making ice cream there is no need for a Ice Making Machine.